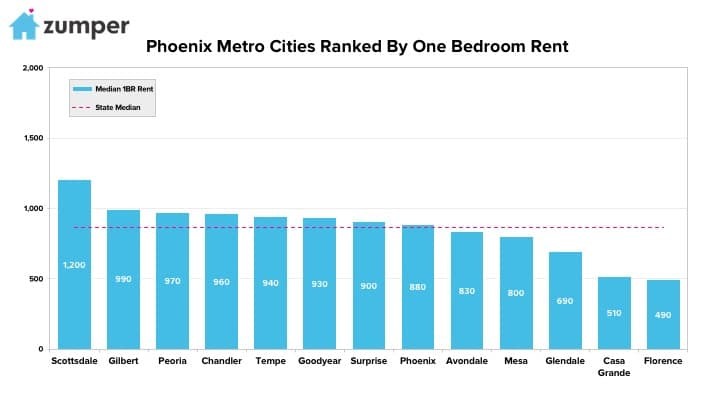 The Zumper Phoenix Metro Report analyzed active listings in June across 13 metro cities to show the most and least expensive cities and cities with the fastest growing rents. – Scottsdale, AZ rent stayed stable since last month at $1,200 and held onto its position as the most expensive in the metro. – Gilbert, AZ saw rent drop $30 to $990 but remained the second most expensive city. –Peoria, AZ climbed 2 spots this month to rank as third with rent at $970. –Florence, AZ had the most affordable rent in the metro with one bedroom units priced at $490. –Casa Grande, AZ, only $20 more than Florence, ranked as the second least expensive city with rent at $510. –Glendale, AZ was third at $690. 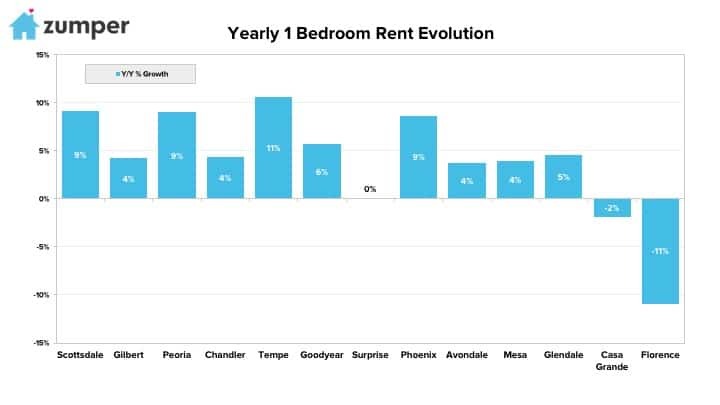 –Tempe, AZ rent saw a 10.6% yearly growth rate, making it the fastest growing in the metro. –Scottsdale, AZ was close behind with rents climbing 9.1%. –Peoria, AZ ranked as third with rent up 9% since this time last year. –Peoria, AZ also made it onto the fastest growing rent on a monthly basis with one bedrooms up 4.3%. The Zumper Phoenix Metro Report analyzed active listings that hit the market in June 2017. Listings are aggregated by city to calculate median asking rents. In the market for a new place? Search all Phoenix apartments on rent on Zumper now.